Tarpon on your bucket list? Book your tarpon trip this spring in the Florida Keys. Experienced and licensed guide. Over 20 years guiding in the Keys. THERE'S NOTHING LIKE TARPON FISHING IN THE KEYS! They reach weights of over 200lbs, they leap 10′ in the air once hooked, they scream drag off the reel so fast that you’ll think the reel will catch fire, and they school by the hundreds in the Florida Keys. There’s no better excitement on the water than tarpon fishing in the lower Florida Keys! In May's installment of The Sustainable Angler, we interview Yellow Dog Fly Fishing Founder, Jim Klug, and discuss topics such as the Yellow Dog Community and Conservation Fund and plastic pollution. The second installment of "The Sustainable Angler" is out! We interview the President of nonprofit Conservation Hawks, Todd Tanner and get his take on how climate change is impacting fisheries. This is the first installment of The Sustainable Angler where we interview the biggest names in fly fishing on topics such as: climate change, plastic pollution and other environmental topics that threaten our fisheries. Our intent is to educate and create more awareness about what we believe are fixable problems...Maybe fly fishing can save the world? We are thrilled to announce our new blog series The Sustainable Angler where we will be interviewing the biggest names in fly fishing and discuss topics like climate change, plastic pollution and policy and how they are negatively impacting our fisheries. The first in the series starts next week with Hilary Hutcheson! We recently had the experience of a lifetime this fishing "Jurassic Lake" in Argentine Patagonia out of Jurassic Lake Lodge. We, like many avid fly fishers, had heard tell of this lake and the monster fish that call it home. It did not disappoint. Taking into account numbers of fish and the incredible average size of the fish, we would venture to say there is not a better trout fishing location on the planet right now. When the wind was ripping stronger, the fishing is better. Good thing, because the wind never let up and neither did the giant, acrobatic ‘bows. This lake is unique, not just for the average 12 lb rainbow trout and possibility of 100+ fish days, but for its history. In short, over 20 years ago rainbows were introduced into the Río Barrancoso that flows into Lago Strobel aka “Jurassic Lake”. As it turns out, they did better than fine, making their way down to the lake and gorging on an incredible scud population in its clear aqua waters. It is now pretty standard to see many fish over 15 lbs during a week of fishing and a few in the 20+ lb class. During the week we spent at Jurassic Lake Lodge we were spoiled with unparalleled fishing, hospitality and a menu one could never expect to dine on 3 hours from the nearest town. Stay tuned to our social media for more tales from Jurassic Lake Lodge. We can’t thank the crew down there enough, Carlos, Llew, William, all of the guides and other staff, you made this week one that will be impossible to match. Mil gracias. Hi everyone I just wanted to do a short report for this Friday morning. When I got on the water today I really took my time making sure to wade in quietly not bumping any rocks with my boots and just very quietly making a few short drifts with just a minimal amount of weight . I want to emphasize being quiet. Also I have begun to notice that my balance while wading is really vital and because of that I am better able to wade in quietly as I lift my foot I am able to keep my balance and step forward without kicking rocks. Also remember its slippery out there so just "slow your roll " and really take your time when wading into a section you think may hold a fish <@)()()>< . Every once in a while you get rewarded with a fish you were not expecting and today was one of those days. After about 5 or 10 minutes of fishing I hooked up and just really took my time landing a 17in bow making sure to really keep serious pressure on her but just slightly bowing to the short runs. Part Two: Lets talk a little about casting. First of all, I am a good caster but I don't claim to be a casting expert; although my fishing buddy, Sarah thinks I am possibly one of the better casters in the state--LOL. Much of good casting is about building several skills and how these skills are connected while preforming a good cast. I think it helps to start your cast from what I call the pocket; Down stream and about 180 deg opposite of where you want your drift to start or cast to end same thing. where you stand is also part of making a great drift. If you're standing in the wrong spot your working against yourself so adjust your stance by how your cast is coming off. A few weeks back I went out carping on a really, really, really neat river in my neck of the woods. A place I never really fished before, but let me tell you one of the best places I've been in a while. 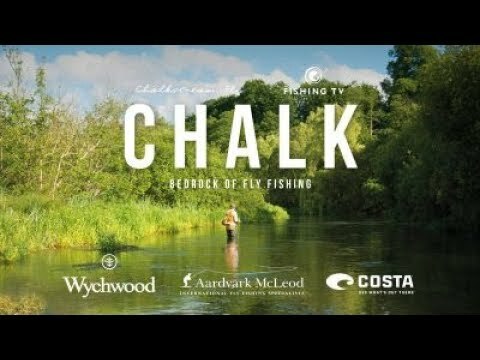 The environment these fish live in for the fly angler is just amazing. The river itself is literally all flat rock. So stripping flies along the bottom won't cause snags and being able to watch fish break off their path to chase your fly is just heart stopping. Carp in general are just way fun to fish for! And out spending a day chasing them when they are usually active all day long not on and off like other species. Get out there and give em a beating! How do you think the fishing is in Switzerland? There's some beautiful mountains lakes. Here is one of them. Nice drone footage. My company, Emerger Strategies, is bringing sustainability to the fly-fishing industry, and our mission is to build purpose-driven brands that inspire solutions to social and environmental problems. That said, the first question I am asked when I tell people this is, "What's a purpose-driven brand?" So, I decided to write a blog to better explain. What's really cool is that there are already purpose-driven brands in the fly-fishing industry, such as Flood Tide Company and Rep Your Water, who are working to minimize their environmental impact while supporting nonprofits that help to further their own missions. I hope you enjoy reading, and if you would like to see your favorite brands become more purpose-driven, let them know! Also, if you are wondering what you can do as a consumer to drive more brands to become purpose-drive, simply buy their products over comparable products! For example, look for the 1% for the Planet logo, or do a little homework before you buy to see how the company makes its products to discover if their values align with your own. To pre-empt the questions: Yes, these are wild brown trout. Yes, they were caught in New England. And no, I won’t name the river. In “protecting” this particular spot, people become downright uncivil when it’s named. These photos underscore one important point: there is great fishing right here in New England. You don’t have to travel out West to find fish like these. And you don’t have to know the name of this spot. Get out there. Explore a new river. You never know what you might find. Thanks to Eric Gass of GS Outfitting for the amazing day out! If there’s a nicer guide out there, I haven’t met them. Latest stats on Atlantic salmon returns and angling reports for North American rivers. Check out the Atlantic Salmon Journal digital version for Summer 2017. This award winning publication covers angling, science, and conservation of the "King of Freshwater Fish." Yesterday was one of those days where everything came together: the sun was out, the bait was abundant, the fish were feeding on top, and the birds helped lead the way. Over the course of the day, three of us brought at least 40-50 fish to the boat. Many were in the 27-36″ class, but a few pushed the scales higher. Our friend in the neighboring boat caught one beast, pictured below. It was a great day fly fishing (and spin fishing) for striped bass off Cape Cod. Hope to be back soon for more. Thanks to Joshua Zacharias of Outermost Angling for a great day. We are very excited to announce an amazing new all-around fly fishing giveaway we've put together our friends from Blue Halo, Decade Reels, Crua Outdoors, and FishOn Energy. Share the link with friends after you enter to get bonus entries. As the rivers start to rise hitting the edges and soft water on the Tailwaters has proven to be successful and especially fun throwin streamers! Now that the waters are getting more colored up and the rapids are starting to roar changing up tactics using bigger flies like Pats Rubber Legs, worms, and streamers, taking the time to explore for soft water and even leaving the river all together to hit the still water will pay off! With the cold, dark days of winter seemingly gone, long summer days on the water are moving closer and closer to reality. Somewhere in the midst of winter, Alina and I moved to Billings, MT to further my dreams of getting into PA school. 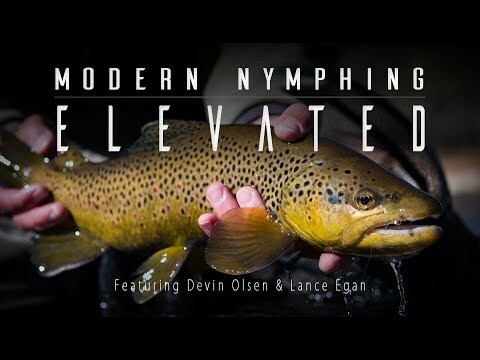 While it may not be the trout capital of Montana, Billings is relatively close to some great fly fishing, namely one of the most renowned tailwaters in the US - The Bighorn River. Now, I've never been a huge fan of fishing big water, so I was a little hesitant when I saw the flows on the Bighorn running at a steady 11,000 cfs. However, even with the increased flows every fishing report had nothing but high praise to offer on the state of fishing on the 'Horn', so we figured why not give it a shot? Alina and I pulled into the 3-Mile access around 10 AM on a slightly overcast, but warm Monday. From the boat launch it was clear to see that the Horn was ripping, but clear. Obviously, wading anywhere beyond a few feet off the bank would be sketchy. We rigged up at the car with San Juan Worms and(8-12), Zebra Midges (16), and Scuds (18) - distance from indicator to bottom fly: About 7 ft. with a couple pieces of split shot above the first nymph. We walked a good ways upstream to get ahead of the other on-foot anglers near the boat launch. Once we had gone 1/3 of a mile or so we picked a nice stretch of bank where the water was both shaded and slower and started wetting our lines. The first hour or so was pretty slow with no obvious strikes or action whatsoever. Around 11:30 the sun came out and the day really started to warm up. At about the same time we moved further up the river to a slightly quicker, more structured piece of water where I hooked a nice brown trout on the San-Juan. A little farther upstream, I landed another small brown trout on the edge of the current in a fast-moving side channel this time on the Zebra midge. Overall, things were beginning to pick up. Just upstream of the side channel the river took a hard turn to the left, leaving a deeper, slower section right up next to some vegetation. There'd been midges skittering above the water all morning and this seemed like the perfect place to find a fish feeding on top. After sitting for a few minutes, sure enough a big head slid out of the water and sipped a midge. This was the first rise I'd seen in over 5 months so it was enough to convince me to tie on a Griffith's Gnat. Of course, it was probably never going to take my fly, so I quickly switched back to a nymphing rig. Sure enough, 3 casts later I had a fish on. Right after I landed the hard-fighting brown, Alina hooked into a fish just a few yards downstream. We fished the rest of the corner without much luck and decided to continue upstream. Unfortunately, the trees and undergrowth were so thick for the next quarter mile that we had to go quite a ways before finding some accessible water. Just as we did start fishing again, the sunshine faded and dark clouds began to seep over the Bighorn Mountains. We kept working upstream as the wind picked up and a light rain started. Before long Alina had hooked and landed a feisty brown trout in a hole right below a quick run. Meanwhile, I went just above the ripple and started working a deeper run right beside the bank. I think I'd floated through four or five times before my indicator suddenly dropped like a rock. I set the hook on the fish that instantly felt bigger than all the others. I struggled to safely wade downstream and keep pressure on the big fish as it worked hard to put distance between us. After chasing it 50-60 yards I finally managed to get the fish under control. Slowly, I pulled the fish methodically closer and closer to the bank as Alina waited downstream with net in hand. It took a few minutes, but eventually we landed the beautiful rainbow, snapped a couple of quick pictures, and let it loose. By the time the fish swam off the sky above was pitch black, the wind was howling at 40 mph, and rain was falling harder by the second. I couldn't help myself from thinking, "This is what fly-fishing is all about!" Alina and I took shelter in a nearby grove of cottonwoods and re-lived the excitement of landing such a nice fish. After fifteen minutes we eventually threw caution to the wind (Literally) and decided to make way back to the parking lot. Lucky for us, the storm passed by the time we arrived at the car and we managed to fish downstream for another hour and a half or so. All in all, it was a pretty epic first day on the Bighorn despite increased flows and our newness to the fishery. Awesome writing as always from Chris Dombrowski for The Drake! 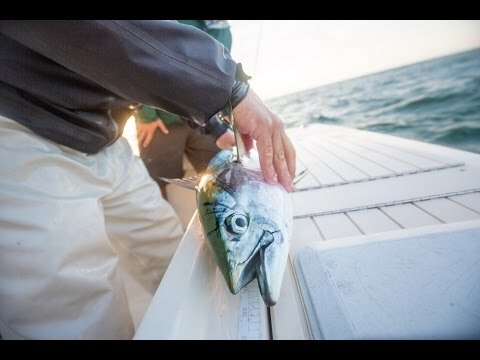 What a great season 2016 was -- false albacore, trout, striped bass, atlantic salon. Truly -- a great year. 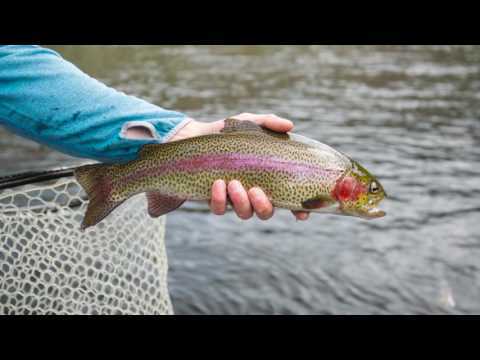 But then, I always think that about a year of fly fishing, especially here in New England. Here's some highlights from 2016. Hope you enjoy! Enjoying warmer weather and the excitement of flood tides nipping at our heels. Last summer, I finally made the pilgrimage to Martha’s Vineyard to fish the Striped Bass and Bluefish Derby — something that I had wanted to do for years, but had escaped me. I went to fish the Derby not for the two title species, but to fly fish for false albacore, my favorite way to close out the season. We were invited out by my good friend Wilson, who sits on the Derby committee. He was a great host, regaling us with stories, showing us good spots, and taking us out on the water. I met up with my friend Bob Green, the fishiest albie fisherman I know, and we hired our friend and guide Tom Rapone for the day. We got into loads of albies, had a few tackle failures, but managed to get my life-long friend Ben Moody into his first. I can tell you one thing: it won’t be his last. What's got a mammoth tusk, multiple fins, rock star guides, DIY legends and a shedload of great stories, images, gear and more? You got it Sherlock. Issue 2 of The Mission is now available online (and print copies are winging their way to stores across South Africa). RepYourWater co-founder and designer Garrison recently snuck out of the office for an early season float with some good friends. Although the water was brisk the the trout were a touch temperamental, the scenery was epic and the beer was cold! Even with rainbow trout so prevalent in our rivers, it the took the longest to create this art piece. My girlfriend Jennifer struggled for a while trying to create a rainbow with our art style. Then finally after many months fishing together and photographing trout, the right on landed in my net. Jenn was so excited, she said "this could be the one". Jenn is always so impressed with rainbows and how they are a work of art themselves. This fish struck the right creative juices and she created our latest piece "The Valley". Every part of this piece was captured in our home valley. This piece is local as local gets. Check out our website for more of our art pieces. Just a few photos from a trip we made to the Biloxi Marsh. Are you ready to get on the tarpon? It's time to gear up and get ready to stalk the silver kings of the sea. We are ready for you to get down to the Florida Keys and get on the poons. Peak season is April and May with the highlight of the full moon to induce the famous palolo worm hatch. If you have never witnessed drunk tarpon on palolo worms, treat yourself to a southbound ticket to the Florida Keys. It's a definite bucket list item. Hope to get you out fishing this spring, you will have a blast! 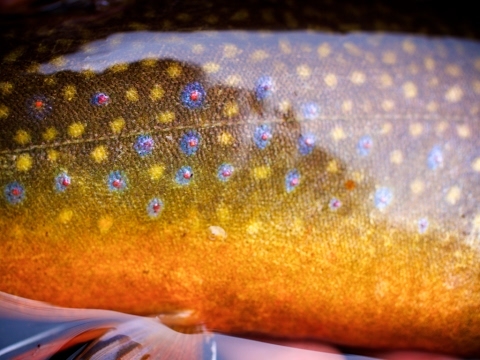 I grew up loving to catch brook trout. They are the first fish I remember pursuing, and although I've now caught many species of fish they are still my favorite Salmonid. My love for chasing these fish has been amplified the last few years by taking my son along. I think I can speak for him when I say the same love for these fish burns inside him now as well! This video is a short teaser from a larger project to come. Nothing like passing it on to the next generation.